The Miami Dolphins will play their first game in front of the home town crowd this season as they host the Cleveland Browns at renovated Hard Rock Stadium Sunday afternoon. Both teams seek their first victory of the season, and the oddsmakers have the home team as a sizable favorite. Miami opened favored by a touchdown, but the line is now closer to -10 with 72 percent of the tickets backing the home team. The total has gone up by half a point from the opener of 41.5 indicating some slight reverse line movement with 55 percent of the public on the under. The Browns suffered a heartbreaking 25-20 setback to Baltimore last week as they let an 18-point lead evaporate. 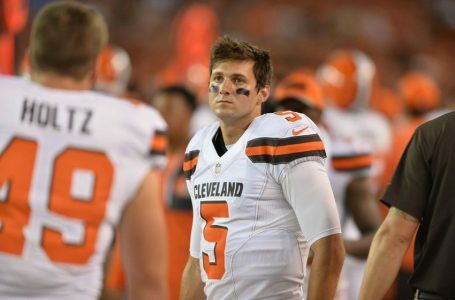 They’ll turn to their fifth starting quarterback in as many contests as we’ll find third-round rookie Cody Kessler under center for the visitors today. Robert Griffin III suffered a season-ending injury in the opening loss to Philadelphia and Josh McCown left their 25-20 setback to Baltimore last week with a left shoulder ailment. On the positive side, Isaiah Crowell has recorded touchdowns in three straight games and five of six after his career-long 85-yard score last week versus the Ravens. The Dolphins’ 30th-ranked D has surrendered 136.5 rushing yards per game this season. The Dolphins were expected to challenge for the division title this year, but their chances are slim after back-to-back defeats to Seattle and New England. Tannehill has not gotten off to a great start this season as he has thrown for 525 yards with two TDs and two INTs, and Miami has averaged just 336.5 ypg (25th) overall and just 17 ppg (27th). Perhaps the Dolphins can turn things around against a Cleveland D that is 20th in yards allowed, giving up 392.5 ypg and 25th in points allowed, giving up 27 ppg. Browns are 2-10 ATS in their last 12 games overall. Browns are 18-7-1 ATS in their last 26 road games vs. a team with a losing home record. Browns are 1-6 ATS in their last 7 vs. AFC. Dolphins are 2-7 ATS in their last 9 games overall. Dolphins are 2-9 ATS in their last 11 home games. Dolphins are 3-14 ATS in their last 17 vs. AFC. Under is 6-1 in Browns last 7 games overall. Under is 6-0 in Browns last 6 road games. Under is 4-1 in Dolphins last 5 games overall. Under is 4-1 in Dolphins last 5 home games. Neither defense is great, but the teams struggle equally on the offensive side of the ball.